I am still working on gaining back all the strength I lost since May 2016 and very hopeful to be able to do some adventures here in Oregon. So I have gathered information on just a few places I would love to visit with my camera, and hopefully maybe with a friend or two. I have not been to these places and the photos seen on pinterest excite me about visiting them. 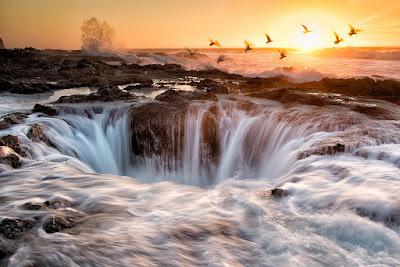 Thor’s Well, sometimes known as the drainpipe of the Pacific, is a strange natural phenomenon that appears to be draining water out of the sea. Right at the edge of the Oregon coast, Thor’s well is best seen at high tide or in stormy weather when the rock provides superb photo opportunities. Visitors to Thor’s Well should also check out the nearby Cape Perpetua Visitor Center, which boasts spectacular ocean views and the chance to spot migrating gray whales. This place has a history! Witches Castle--Forest Park in Portland, Oregon most notably the area around Balch Creek has some interesting history behind it as well as playing host to one of the area’s most famous haunted places. In 1850, Danford Balch filed a land claim on this portion of land near what was then the fledgling settlement of Portland. Danford’s land was large enough that he needed help in order to clear it. He hired a transient worker named Mortimer Stump who was from Vancouver. Balch allowed him to stay with the he and his family which consisted of his wife Mary Jane and his 9 children. Mortimer was with the family so long that one thing led to another and he fell in love with Danford’s 15 year old daughter Anna. Mortimer asked for permission to marry Anna but her parents refused. The couple threatened to elope and Danford exclaimed that if they did he would kill Mortimer. Well young lovers did not heed this warning and Mortimer ran off to Vancouver with Anna in November of 1858 where they were married. This sparked a feud between the Balch and Stump families. A few weeks later Mortimer, Anna, and some other members of the Stump family returned to Portland for some supplies and encountered Danford. Having been nagged and tormented by Mary Jane to make good on his promise, Danford later claimed that his wife “bewitched” him into carrying out his threat to kill Mortimer and return their daughter to the family. In a drunken stupor, Danford pulled a shotgun and shot Mortimer in the head. Balch was promptly arrested, however the deteriorated condition of the wooden prison allowed him to later escape while awaiting his trial. He hid out on his own property and was again found and arrested some 6 months later. Danford Balch was put on trial and convicted for the murder of Mortimer and was hanged to death on October 17, 1859. This was the first legal hanging that occured in the newly formed Oregon Territory. Mary Jane continued to live at the Balch cabin, but at Danford’s request divided up the land amoung her children. Over the years, the land was passed to various owners but was of little use and was given to the City of Portland by Donald Macleay in 1897 to be used as a park. In the 1950’s a stone structure was built to house restrooms and a ranger station for the park near the site of the old Balch cabin. Over time this structure deteriorated from vandalism and was abandoned in the 1960’s. This has since became known as “The Witch’s Castle”. It is rumored that this was once a 1600’s trading post, however the existing structure was built almost 350 years later. Whether a previous structure was there or not, it is unknown. 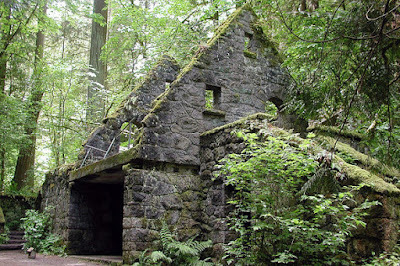 The Witch’s House is an easy half-mile hike from the Upper Macleay Parking lot near the Portland Audubon Society, or a slightly longer three-quarter mile jaunt starting from the Lower Macleay Parking lot at at NW 30th and Upshur. One can take the Aspen trail to get there. A great way of accessing the trailhead is to walk up on Thruman Street. This corridor is a 12 mile, forested, linear park with a rugged, steep coastline interrupted by small sand beaches. 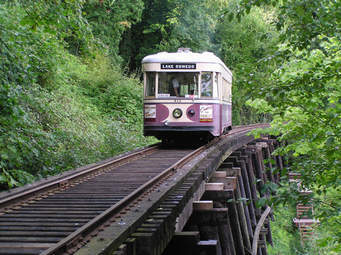 This park was named in honor of Samuel H. Boardman, the first Oregon Parks superintendent. He and others of his generation felt this shining coastline should be saved for the public. What gems they gave us: admire the 300-year old sitka spruce trees, gaze at the amazing Arch Rock and Natural Bridges, and walk the 27 miles of Oregon Coast Trail that weave through the giant forests. Seaside prairies, spectacular vistas, secluded cove beaches, rugged cliffs and forested sea stacks come one after the other throughout this park. Stand and ponder the old shell middens and wonder what it was like to live in a Native American village by the Pacific Ocean. Cape Ferrelo loop: A 1-mile loop trail climbs the grassy slope (carpeted with wildflowers each spring) to the top of the cape for breathtaking views of the rugged coastline and photo-worthy Oregon sunsets. The cape is also an excellent spot for whale watching in fall and spring. Natural Bridges: Follow a short trail to one of the best viewpoints in the park—the seven iconic arched rocks and blowholes known as Natural Bridges. 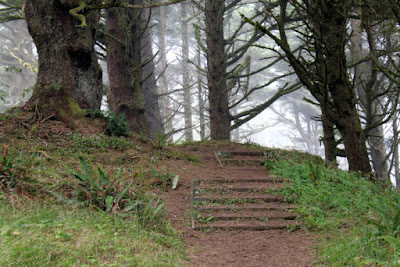 Here you’ll find a memorial to Dr. Samuel Dicken, who first envisioned the Oregon Coast Trail. 7 Arch Rock: From the paved parking lot, stroll down a short paved path to an overlook featuring a series of offshore sea stacks and islands. In spring, wildflowers brighten the meadows. Secret Beach and Thunder Rock Cove: From the small gravel parking area, enjoy the views of the cove while you look for migrating gray whales in the winter and spring. Follow a rough 3/4-mile trail down to Secret Beach. At low tide, head south around the rocks to find a secluded beach with lots of pools for exploring. a. Starting in Lake Oswego, the Willamette Shore Trolley will take you on a scenic ride along the shore of the Willamette River in an authentic vintage trolley. Looks scenic! and it can be easy to miss if you drive by looking for a more established trailhead. The trailhead is literally right off the highway, which creates an intense juxtaposition; just as you rush across the road to escape oncoming traffic, you plunge into a deep and luxuriant coastal forest with walls of Sitka spruce and rhododendrons thick enough to close off your highway experience. 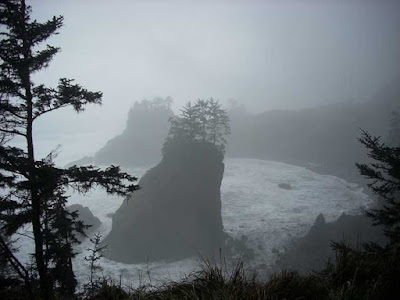 Immediately you will find a signed trail junction, where you should walk left to stay on the Hobbit Trail and get to the beach, or walk right if you’d like a longer hike to Heceta Head. The trail down to the beach affords one or two more expansive views of the ocean, but the real pleasure of this trail is wandering through the interior forest. At times it feels like you are in a hall decorated with salal and a root woven runner. From where you pick up the Hobbit Trail to the beach, it’s actually quite short – a 1/2 mile is all. And, frankly, the Heceta Head Lighthouse trail is more beautiful, but the Hobbit Trail did live up to its name with some very cool hiking as well, including the famed Hobbit hole portion that opens onto the beach. 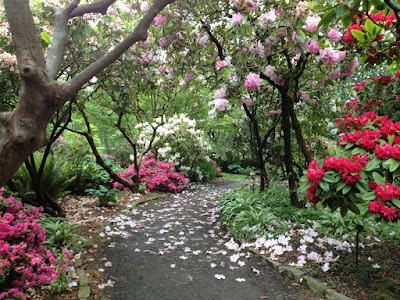 Crystal Springs Rhododendron Garden is located at 5801 SE 28th Avenue, Portland, Oregon 97202 between SE Steele and SE Woodstock. $4.00, 10 AM – 6 PM, March 1st – September 1st, EXCEPT no charge Monday & Tuesday. Peak bloom: late April – early May. Self-Guided: Booklet available at the Gatehouse. Mt. St. Helen's from Sherrard Point. 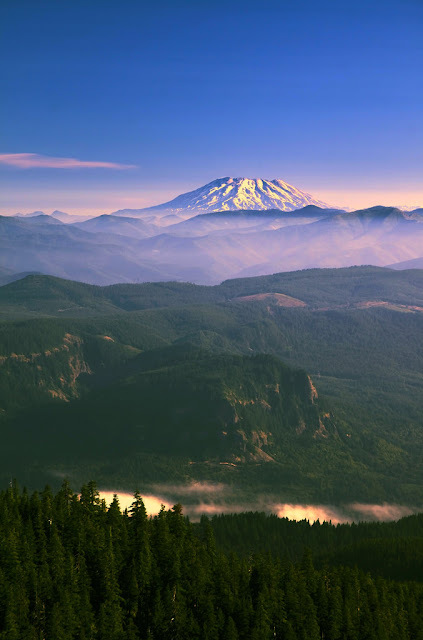 Located at the summit of the beautiful Larch Mountain in the Columbia River Gorge, Sherrard Point is a little-known, jaw-dropping overlook that will blow you away. A short half mile stroll through an emerald green forest will land you on a mountaintop platform from which you’ll see an endless expanse of rolling green hills and Cascade mountain peaks. To get the lookout, you'll park at the Larch Mountain Trailhead and follow the concrete path through the woods for a quarter-mile. Near the end of the trail, the trees will end and you'll emerge onto this incredible observation deck (rimmed with a short fence) with panoramic views of the expansive Cascade wilderness. a. This beautiful cove is located 5 miles south of the famous Cannon Beach at Hug Point State Park. 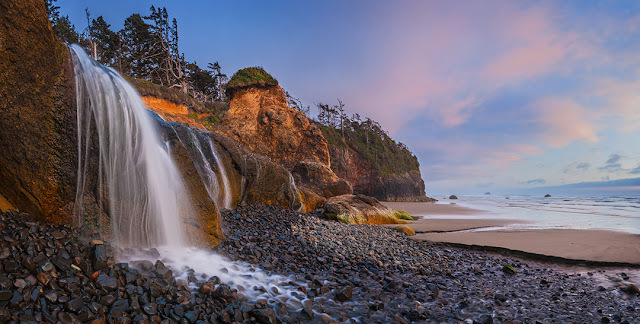 A leisurely half-mile walk from the parking lot will lead you to the enchanting Hug Point Waterfall. Fed by the lovely Fah Creek, The waterfall varies in magnitude depending on the season, ranging from an ethereal trickle to a full-on cascade. Over the years, the tide has carved unique caves into the cliffs, some of which are large enough to explore! Tide pools speckle the coastline here, full of glowing marine life. At low tide, you'll be able to see the treacherous road that was carved into the cliff long ago for stage coaches. This bumpy rock ledge is now often covered in muscles and tide pools. In some places, you can still see the tracks of the wagon wheels! Tides can change quickly, so make sure not to turn your back the ocean, especially when you're exploring tide pools or caves. You should only visit the beach at low tide, so be sure to check the tide charts before showing up. Just a few of the things on my list! I'm really looking forward to your photography and comments. 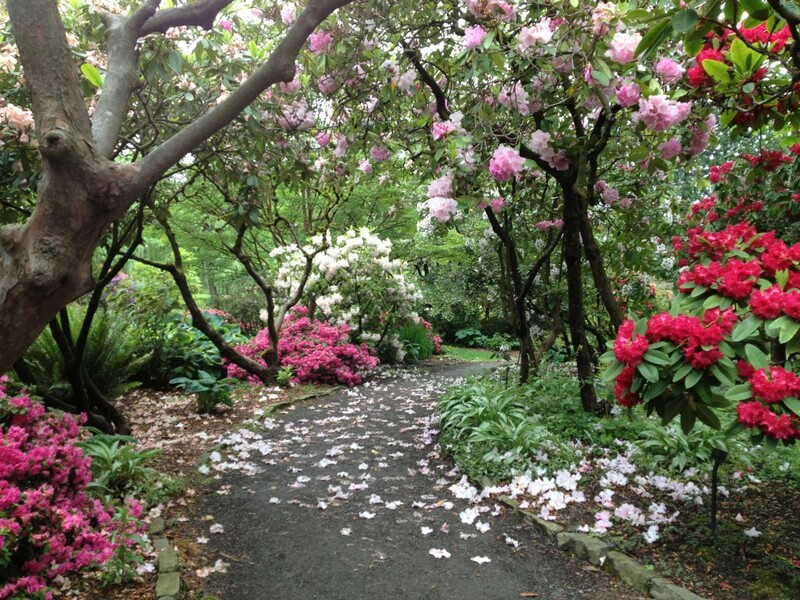 When you are up to taking stairs, give me a hollar and we can do the Rhododendron garden. Woo Hoo!! I will take you up on it. How many stairs? I do hope you get to visit these places.Your camera will be kept busy and I trust wen blond will see the results.Happy New Year. What a great idea--a well-researched list of places you'd like to get to with your camera AND to meet new people. That should motivate you and your immune system to get back to golden shape! I hope 2017 brings you energy and a chance to see ALL of these places. Won't you have fun. I would take in some of spots with you. Happy New Year sweet friend. Rose, I hope that you get your strength back and get to go to all of these places! I am pinning. Would love to go to some next time we vacation to OR. What a lovely list of places! Those are some really wonderful places to visit! Happy new year! My wish is that you will get to visit them all. You've reminded me of some lovely spots, but even better you've shown me some I didn't know about and would love to see. Especially nice that there are only short hikes involved. Maybe I'll arrange to take both you and hubby Gene sometime when you feel up to it. Let's plan for it.